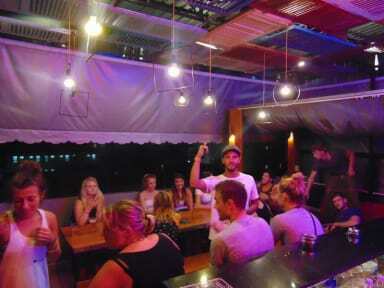 The selling point of this hostel is the free beers on the rooftop bar which happens every night from 6-7pm. Also the staff facilitate drinking games amongst guests which was very fun! This place is special- staffed by sweet, funny people who make it great. Facilities are ok, but the evenings in are what you stay for. Great food and the beach nearby. Perfect place if you like to meet fellow travellers and have a couple of drinks or more. Beer is for free one hour long. The top floor has a fantastic 180 degree view of the area. Brilliant hostel with delicious food, comfortable beds but a lot of noise from the rooftop party. If you’re staying in Nha Trang, this is an absolute must. The staff are all very friendly and helpful ! You get free beers from 6-7 and the atmosphere on the rooftop is so good. 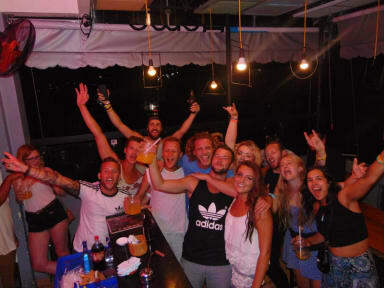 Everyone socialises and it’s a great chance to make friends. Also it was such good value!! Not the worst place we have stayed in! €2 a night so what can you expect! Room was a bit small but the bathroom was big enough and shower was good! Beds a bit hard and the pillows are flat. Could do with a bit of an upgrade as the whole building seems a bit outdated but for what you pay for it’s white good and safe! Nice social place. My bracelet was stolen though once the room was clean. Usually I’m good with keeping things safe but just forgot this one. Also breakfast was a bit confusing.... it’s free and you get a free coffee but I don’t eat brekkie so I just wanted a coffee no they don’t do unless you get food. I didn’t want to waste food. Plus you can’t pay for a coffee they don’t do them 🤦🏻‍♀️ though amazing tattoo studio next door that I will recommend and really good cheap price.